Effects Of Palm Wine On Male And Female Fertility – Palm wine is the main brand of traditional wine in some countries including Nigeria, Ghana and many other countries of the African continent and around the world. Palm wine has many beneficial features being often used not just as a drink but for many different purposes. But what is the connection between palm wine and fertility? Read our post to find out the answer. 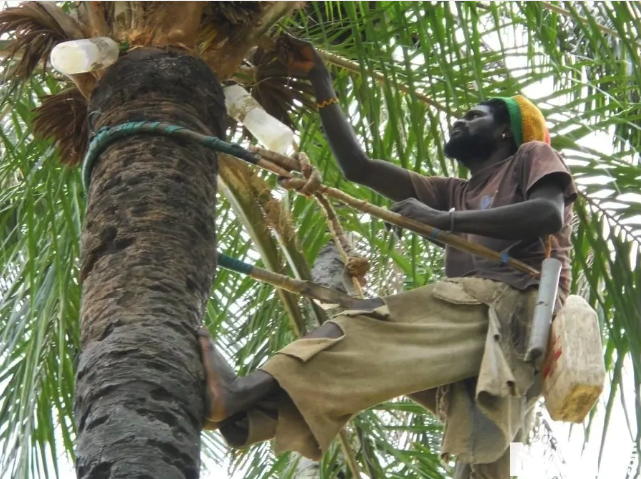 Palm wine is also called “Mmanya”, “Emu”, “Bammi”, “Mmin-efik”, and Mmin-ukot”, “Matango,” “Fitchuk”, “Nsafufuo”, “Doka”, “Tuba”, “Toddy”, “Lambong” in various tribes and countries. Palm wine can be gotten from the Raphia palm trees or oil palm trees Elaeis guineensis. This beverage is often consumed at social events and in homes as a traditional drink. Palm wine is helpful in infertility treatment. 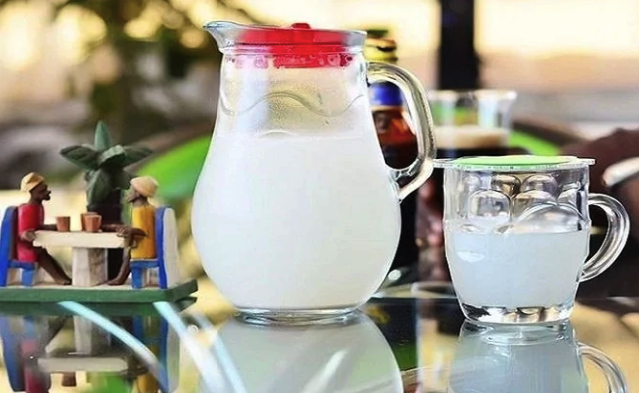 It is also widely used for industrial purposes, for example, as yeast for baking, and alcohol for the portable ethanol production. The yeast contained in the palm wine is claimed to promote lactation and improve eyesight. You might be wondering about the taste of the palm wine. There actually exist a lot of kinds of palm trees, but wine made of the sap (natural juice) tastes almost the same, like a mixture of pineapple and lemon. The studies show that fermented palm wine increases reproductive parameters in male albino rats. However, this information is considered insufficient. The controversy lies in the dual structure of palm wine. On the one hand, this beverage has a biological positive impact on health containing many nutritious ingredients and mineral elements such as carbohydrate, crude protein, lipid, crude fiber, ash, calories, moisture, Vitamins A and C, iron (Fe 2+), copper (Cu 2+), magnesium (Mg 2+), calcium (Ca 2+), and zinc (Zn 2+). 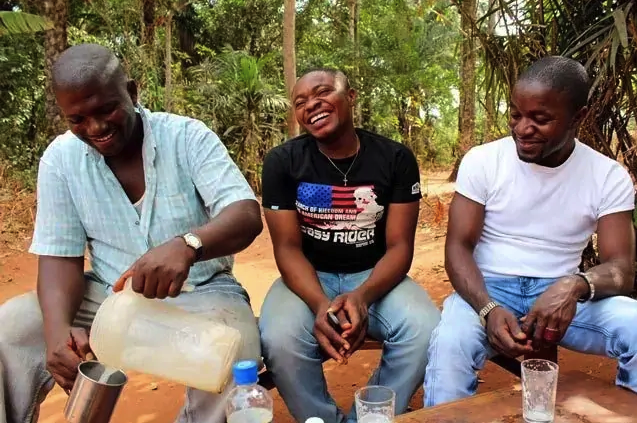 On the other hand, palm wine is still an alcoholic drink (2%–8%), and many biological disorders may be caused by endocrine disrupting chemicals included alcohol. While the benefits of alcohol-containing products are still being debated, some useful functions have been noticed to make changes in cells of the liver, kidney brain, and even reproductive structures. Palm wine is known to be a popular alcoholic drink in many African countries. This alcohol beverage is indicated to influence male reproductive function. Palm wine has been reported to decrease testosterone levels but without a significant change in the morphology. An experiment was conducted to determine the connection between palm wine and fertility with the use of experimental animals, namely, adult rats which were allocated into two groups. The duration of the experiment was 3 weeks. The group A was given a rat chow and water. Group B animals were subjected to an 0ral treatment of palm wine for 21 days. The doses were calculated on the base of the body weight of the animal. After the experiment was finished, the histological analysis was made. The rats’ tissue samples passed through examination. The results of the experiment on the influence of palm wine on reproduction and fertility showed that there was a significant change in the tissues. When the samples from the two groups were compared, the sort of gradual distortion was observed in the group B. In the control group, there were no changes in the tissue samples. While the cells normally follow an orderly pattern of arrangement, in the samples of the group B these cells were distorted which caused changes in the tissue structure. These changes may cause a dysfunction of the seminiferous tubules which are the major building blocks of the primary male organs. These results might explain a significant decrease in testosterone level in male rats. Also, palm wine intake is closely connected with weight gain. The findings of investigation have been quite contradictory. This study didn’t show any clear association between the intake of the palm wine and weight gain. Similarly to men’s health, excessive consumption of palm wine has a negative effect on women’s health. It may cause damage of liver accumulating fat in the liver. Also, palm-wine is known to decrease blood clotting factor which is very dangerous as it can lead to uncontrolled bleeding. There are no proven facts of negative or positive benefits of palm wine to female fertility. While palm wine may bring some benefits to health, however, its excessive consumption can be harmful to both men and women. 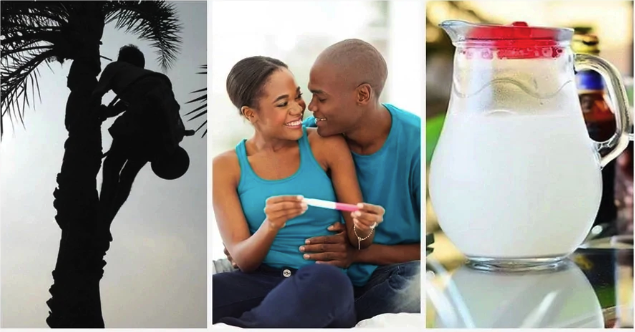 0 Response to "Effects Of Palm Wine On Male And Female Fertility (Must Read)"